JGB Enterprises, Inc. was awarded the contract to supply the military with these Cold Water Shaving Stands. Each Stand consists of three stainless steel shaving stations that are set up to attach to local power and plumbing facilities. 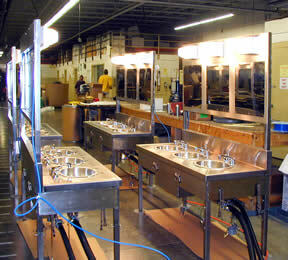 JGB Enterprises, Inc. sourced the parts, manufactured the units, packaged and shipped them to the customer.